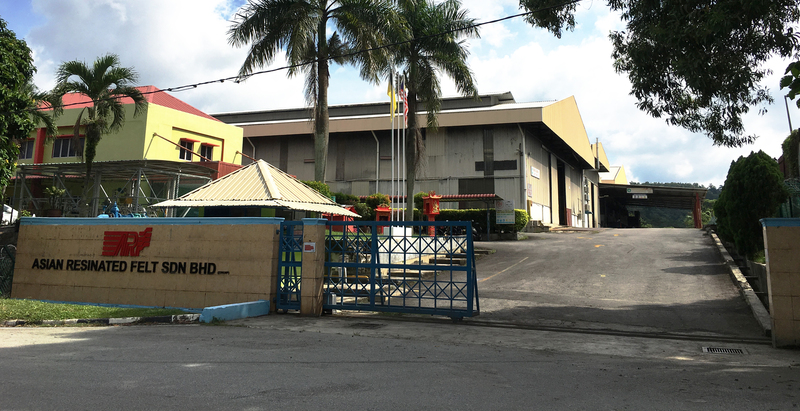 ASIAN RESINATED FELT SDN BHD is fully equipped with a modern laboratory and testing facilities to ensure strict quality control from the processing of raw materials to finished products.. The quality assurance is computed by the latest production technology, modern production equipment as well as qualified and well trained personnel. Vision Statement: To become the leading manufacturer of felt for acoustics and heat insulation industries. ACHIEVING on company’s target towards customer satisfaction via QCDS. REALIZATION on product superiority through smart business partnership. FACILITATE continuous improvement on company resources. BELIEVE in company’s business continuity. Stringent control lead to SUPERIOR Product . Excellent SERVICES via strong technical support and prompt delivery. Continuous improvement towards customer SATISFACTION. RESIN FELT MANUFACTURING PROCESS: Resin felt is a lightweight thermal and acoustic insulating material that combines design flexibility and high performance. It is high quality non-­‐woven felt manufactured from synthetic and natural fibers through a completely automated process. Resin felt is self-­‐extinguishing which does not promote combustion and cause Corrosion to metals. It is also has good dimensional stability over a wide temperature range and has low moisture absorption property. TEXTILES FELT MANUFACTURING PROCESS: Phenolic resin bonded felts from shredded organic fibers have become an increasingly important application for solid pulverized phenolic resins. These porous felt materials are common acoustical insulation products used in the automotive industry for machinery housings, in living or office spaces. The fibers used are organic based (cotto-­‐cellulose-­‐polyester, jute) which are shredded into fibers 15 to 35mm long.